ECOSOC Chamber, a gift from Sweden, was originally designed by famed Swedish architect Svem Markelius. Renovated in 2013, the Chamber features the new curtain ‘Diaologos’ by Ann Edholm. 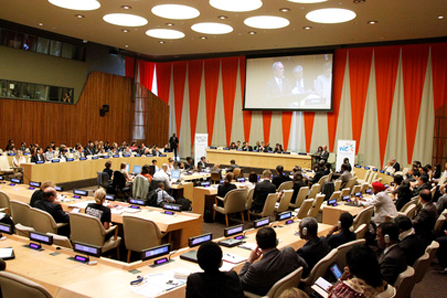 ECOSOC engages a wide variety of stakeholders – policymakers, parliamentarians, academics, major groups, foundations, business sector representatives and 3,200+ registered non-governmental organizations – in a productive dialogue on sustainable development through a programmatic cycle of meetings. The work of the Council is guided by an issue-based approach, and there is an annual theme that accompanies each programmatic cycle, ensuring a sustained and focused discussion among multiple stakeholders. Development Cooperation Forum (DCF), held on a biannual basis since 2007, reviews trends and progress in development cooperation on a biannual basis. Integration Segment, held annually since 2014, promotes the balanced integration of the economic, social and environmental dimensions of sustainable development both within the United Nations system and beyond. Humanitarian Affairs Segment, that takes place in alternate years in New York and Geneva, seeks to strengthen the coordination of the United Nations’ humanitarian efforts. Operational Activities for Development Segment, held annually, provides overall coordination and guidance for United Nations funds and programmes on a system-wide basis. Coordination and Management Meetings (CMM), held throughout the year, review the reports of its subsidiary and expert bodies; promote system-wide coordination and review of development issues; and consider special country situation or regional issues. Youth Forum, held annually since 2012, brings the voice of youth into the discussion of the Millennium Development Goals and post-2015 development agenda. Partnership Forum, held annually since 2008 and linked to the theme of the Council’s Annual Ministerial Review, aims at finding innovative ways to collaborate with the private sector and foundations in search of solutions for the many development challenges facing governments today.